Keeping warm at training or games in the winter months is always a challenge, but your answer is here with these Nike Dry Strike 3/4 Football Training Pants in Binary Blue and Industrial Blue. Using Nike's Dri-Fit technology, these training pants are made from a soft mix of polyester and elastane. The performance of Dri-Fit fabric means that sweat is pulled away from the body to leave you comfortably dry. Completed with zipping pockets to keep your valuables safe and secure, the pants are finished with an elasticated waistband and are secured in place by drawstrings. 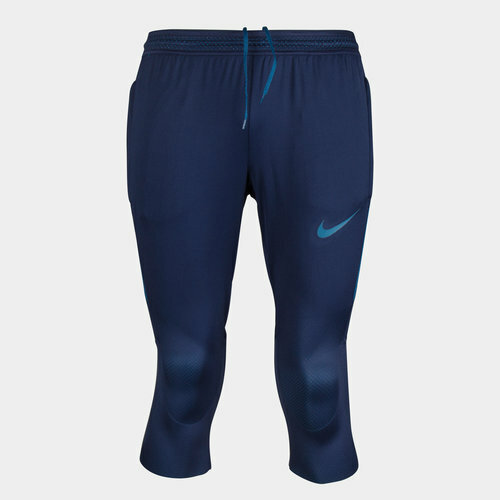 Sporting a binary blue and industrial blue look, the signature Swoosh is the only addition to these training pants. Make sure you're ready for the next big game when you train in these Nike Dry Strike 3/4 Football Training Pants.